20: BLOOD DRIVE at Cobb Hospital. Upcoming Drives for 2010: Sept. 20, Oct. 18, Nov. 15, Dec. 20. (11 a.m. to 4 p.m. - Auditorium). 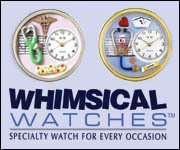 To schedule your appointment visit www.givelife.org and use the password "wsch." 21: ANNIVERSARY. Area churches will hold a brief service to mark the one-year anniversary of the historic floods in our area. The service will begin at 6pm on Tuesday, September 21 at the Collar Park Gazebo in Austell (located between the Collar Community Center, 2625 Washington St., and City Hall/Police HQ). Rain location: Collar Community Center. We will celebrate the recovery and remember those still affected. 21: AFTER HOURS VBA. A Vinings Business Association Business After Hours, sponsored and hosted by First Citizens from 5:30 to 7:30. The event will be held at the bank’s area location, 3300 Cumberland Blvd. 25: DOCUMENT SHREDDING EVENT. Keep Cobb Beautiful will partner with Keep Marietta Beautiful and Keep Smyrna Beautiful to offer an autumn Document Shredding Day for Cobb on September 25 from 9 a.m. to noon at Smyrna City Hall. This is your opportunity to have household papers securely shredded on site, at no cost. Each car will be limited to 100 pounds of documents to be shredded. ONLY PAPER PRODUCTS. The following things are NOT acceptable: Plastics, CD’s, Floppy Discs, Electronics, Cardboard, Large binders with metal rings/clips. This shredding event is also being held at the same day and time in Marietta at Piedmont Church on Piedmont Road and the City of Marietta lot on North Marietta Parkway. 25: TALENT SHOW. Trinity United Methodist Church community wide talent show. You are invited to perform on Saturday, September 25, 2010, at 7:00 pm in the Local talented gymnasts, dancers, singers, comedians, martial artists, magicians, musicians, etc… will be performing. The talent show is open to all ages. Acts are limited to 3 minutes or less due to time constraints. To register to perform or to be an audience member please contact the church at info@trinityaustell.org or 770-948-6307. Registration deadline is September 22 and cost $3 per performer. Audience tickets are $5.00 each for ages 15 and up, $3.00 each for 6-14 year olds or a family packages is $15.00. Proceeds from the talent show will benefit the free community feeding program, Oasis, which provides free dinners to the community every Tuesday night at 6 p.m. at the church. 25: ARTS STUDY. The public is invited to the Mableton Arts Study - Open House to learn more and give opinions. The Open House will be from 10 a.m. until noon on Saturday, September 25, at Mable House Arts Center , 5239 Floyd Road , Mableton . For more information call 770-528-2018. 26: VININGS HOME TOUR. The 2010 Tour of Homes date has been set for Sunday afternoon, September 26. Jane Kennedy, owner of Curves in Vinings, is returning to Co-Chair the Tour of Homes with Christian Brown. Christian has experience working with home tours and is very excited about joining Jane to make the Vinings Tour of Homes a fabulous event. The Vinings Tour of Homes Preview Party will be Saturday evening, September 25 at a beautiful home in Vinings. South City Kitchen will again sponsor and cater this ever popular party. For more details check our website at www.vinings.org. or contact VHPS Executive Director Gillian Greer at 770-432-3343. 26: CONCERT. Northside Drive Baptist Church’s 4th season of Music on the Hill will open on September 26 with a concert by Jacksonville Symphony Orchestra’s principal cellist Alexei Romanenko and Canadian pianist Christine Yoshikawa. They will perform works by Stravinsky, R. Strauss, and Giuseppe Valnentini. The 3:00 PM concert is offered free to the public, and will be held in the chapel (handicap accessible). For further information, contact Jim Barksdale at 404-274-2171. 29: HEALTH SEMINAR. Managing Stress of Everyday Life. September 29 at 7 p.m. Presented by Kirsten Person-Ramey, LAPC. Have changes in your life left you stressed and feeling helpless? Are your work and family life impacted by your busy life? Are you experiencing some physical complications as a result of living such a hectic life? None of us can live a totally stress-free life, but we can learn how to better cope with stress. This seminar will teach you some stress management tools to help you get through those difficult life situations. These practical tips can be used both at work and at home. This seminar is FREE and will be held in the Emory-Adventist hospital’s cafeteria. Call 770-319-2025 to reserve your spot. 1: FALL FESTIVAL. Campbell Middle School PTSA is sponsoring our annual fall festival on October 1st from 4:30-7:30 p.m. Advance tickets are $8 or $10 at the door; price includes most activities except dunk tank, food or drinks. Individual tickets on sale for games and additional activities; a DJ, Games, Prizes, Food and a Silent Auction. Excitement and Fun for All Who Attend. 2: THE BLESSING OF THE ANIMALS. The Church of the Good Shepard Episcopal Church. The service will be conducted in both English and Spanish and held outdoors if weather permits. In case of rain, we’ll go into our fellowship hall. Bring your pet and join us for a fun and touching sight to behold! Saturday October 2 at 10 a.m. PETS MUST BE IN CARRIER, OR ON LEASH. The church is on Love Street ¾ mile south of downtown Austell, 6216 Love Street Austell, GA 30168 770.948.1567. 3: BLESSING OF THE ANIMALS. Sunday, October. 3, at 3 p.m. Blessing of the Animals on the Log Cabin Community Church grounds, service with prayers and songs of creation, pet blessing, and an offering collected for the Humane Society of Cobb County. All leased or crated pets and animals are welcome. Rev. Rich Landers, Pastor. 2699 Log Cabin Drive, Smyrna. Call 404- 351-1912. Web: www.logcabinchurch.com. 3: FALL FAIR. Teasley Elementary Fall Fair. The community is welcome to join us! Games, Activities, Jumpies, Prizes, Food, Crafts, something fun for all ages! Campbell Middle School , 3295 Atlanta Road , Smyrna , Sunday October 3 from 2:45 to 5 p.m.
4: FIRST MONDAY BREAKFAST, October 4 at the Cobb Energy Performing Arts Centre. 7:30 a.m. Program: Public Safety Recognition. General Admission: $50 Members: $20 online; $35 at door. Table of 10: $200. Online Registration Closes: Sept. 30 at noon Registration can be done on our website at www.cobbchamber.org. 6: NETWORKING FOR A CAUSE is sponsored by Women Who Barter, a women's business directory and networking association. For the past three months, our host has been M.U.S.T. Ministries in Marietta. Our next "Networking for a Cause" will be held at the Mansour Center located at 995 Roswell Street NE, Marietta on October 6th, 3-5 p.m. This is a FREE event and in lieu of cash donations, we request that nonperishable donations be brought. 6: SOFTBALL GAME. Wednesday, October 6. Chamber Chargers vs. Government Gorillas Annual Softball Game at Tolleson Park in Smyrna from 5 to 7 p.m. Free Event. Registration is required by Oct. 4 at noon to attend Registration can be done on our website at www.cobbchamber.org. 7: LUNCH N' LEARN seminars offered at no charge by Julie Rea, Financial Advisor, Edward Jones 2849 Paces Ferry Road, Ste. 140 Vinings. 12 noon - 1p.m. (Box Lunch). RSVP 770-432-7649 Space is Limited. Thursday, 10/7/10 Retirement Has Changed, What's Your Next Move? Thursday 10/14/10 Roth IRA's, Retirement Can Be Less Taxing. Thursday 10/21/10 Get Back on Track. Develop your Financial Recovery Plan. Thursday 10/28/10 Roll It, Take It, Leave It, Move It: Knowing Your Employer Retirement Plan Options. 8: MEET AN AWARD-WINNING book illustrator. Artist and award-winning children’s book illustrator, Gregory Christie, will be at the South Cobb Regional Library (805 Clay Road, Mableton) on Oct. 8 at 3:30 p.m., for a free meet and greet. Primarily known for his children’s book illustrations, the New York resident has been recognized for his work and received numerous awards including: Coretta Scott King Award honor for, ‘Brothers in Hope; The Story of the Lost boys of Sudan’ and for his illustrations in, ‘Only Passing Through: The Story of Sojourner Truth.’ For information call 678-398-5843. 9: SPARTAN SPRINT 5K Road Race: Saturday, October 9 at 8 a.m. Come out and race in this 5K event fundraiser for the Campbell High School Football team. All proceeds go to the Football program. There will be a free fun run for the kids just prior to the 5K start with finisher's ribbons for all kids. 5K run awards 3 deep per age group (14-Under, 15-19, 20-24... 85+). Start and finish at the football stadium. The race will be Chip-Timed, and it is a USATF Certified Course and a Peachtree Road Race Qualifier. To sign up, go to: http://www.active.com/running/smyrna-ga/spartan-sprint-5k-2010. 15-17: BOOK SALE. The ‘Friends of the Library’ book sale will be Oct. 15-17 (Fri.-Sun.) at the Jim R. Miller Park (2245 Callaway Road in Marietta). For information call 770-528-2320. 18: BLOOD DRIVE at Cobb Hospital. Upcoming Drives for 2010: Oct. 18, Nov. 15, Dec. 20. (11 a.m. to 4 p.m. - Auditorium). To schedule your appointment visit www.givelife.org and use the password "wsch." 27: SOUTH COBB AREA COUNCIL, Wednesday, October 27, at the Coach George E. Ford Center, 11:45 a.m. Program is South Cobb Public Safety Appreciation General Admission: $30. Members: $10 online; $20 at the door. Online Registration Closes: Oct. 25 at noon Registration can be done on our website at www.cobbchamber.org. 1: FIRST MONDAY BREAKFAST, November 1, at the Atlanta Marriott Northwest 7:30 a.m. with speakers: Dr. Emily Lembeck, superintendent, Marietta Board of Education and Fred Sanderson, superintendent, Cobb County School District General Admission: $50. Members: $20 online; $35 at door. Online Registration Closes: Oct. 28 at noon Registration can be done on our website at www.cobbchamber.org. 10: CUMBERLAND AREA COUNCIL Wednesday, November 10 at The Georgian Club. 11:45 a.m. General Admission: $40 Members: $20 online; $30 at the door Online Registration Closes: Nov. 8 at noon. Registration at www.cobbchamber.org. 11: VETERANS DAY CEEREMONY. Thursday, November 11 - 11 a.m. - Smyrna's 3rd Annual Veterans Day Ceremony at Brinkley Park (next to American Legion Post 160 off of Concord Road). Speaker - Ben S. Malcom. Colonel Malcom is known throughout the Armed Forces as laying the foundation for today's Special Forces Operations. 11: SMYRNA AREA COUNCIL Thursday, November 11 at the Smyrna Community Center 7:45 a.m. General Admission: $30 Members: $10 online; $20 at the door Online Registration Closes: Nov. 9 at noon. Registration at www.cobbchamber.org. AEROBICS CLASS. Austell First United Methodist Church offers free weekly low-impact aerobics class in the church's fellowship hall every Wednesday Night from 6:30 – 7:30 p.m. with certified group fitness instructor Cindy Standard. Austell First UMC is located at 5705 Mulberry Street in downtown Austell, just north of the railroad tracks and City Hall. More details can be found at www.blessaustell.com or by calling 770-948-1806. BOY SCOUT TROOP 61 meets every Monday night at 7:30pm in the Troop Lodge at Bethany Methodist Church at the intersection of Hurt and Hicks Roads. Cub Pack 61 meets Tuesday at 6:30 p.m. in the Bethany Gym. SMYRNA BOY SCOUT Troop 11 meets at 7 p.m. every Monday evening at Smyrna First United Methodist Church. New Scouts are welcome! Please visit our website: www.smyrnatroop11.com. DIVORCECARE is a friendly, caring group of people who will walk alongside you through one of life’s most difficult experiences. Sessions are every Monday at 6 p.m. beginning August 2 with an orientation and classes starting August 9. No preregistration is required. Classes are held at Smyrna First Baptist Church; 1275 Church St; Smyrna; 770-435-3231. For more information, go to www.smyrnafirst.org and click on Discipleship. DIVORCE CARE FOR KIDS is a special group to help children heal from the hurt caused by the separation or divorce of their parents. At our weekly DC4K group, kids make friends with other kids who understand how they feel and the things they are going through. Pre-registration is required. Registration forms are available in the church office at 1275 Church St; Smyrna; 770-435-3231; or you can print a form by going to www.smyrnafirst.org. Click on discipleship and forms. Sessions are every Monday at 6 p.m. beginning August 2 with an orientation and classes starting August 9th. One session of DC4K is 13 weeks and after week 2 registration is closed. Classes are held at Smyrna First Baptist Church; 1275 Church St; Smyrna; 770-435-3231. FARMERS MARKET. Farmers Atlanta Road Market (FARM) in the St. Benedicts church parking lot (intersection of East-West Connector and Atlanta Road) on TUESDAYS from 4 p.m. - dusk. FARM will focus on local area farmers and artisans selling their own fruits, vegetables, cheeses, breads and other food goods. FRESH PRODUCE MARKET. The 2nd year of the Fresh Produce Market in downtown Smyrna SATURDAYS from 8 a.m. until noon in the Smyrna First Baptist Church parking lot adjacent to the Market Village. The market is expected to run through October with regular and seasonal vendors bringing loads of beautiful and wholesome produce to you each week. PACES FERRY FARMER'S MARKET, located at 2375 Paces Ferry Road at Cumberland United Methodist Church near I-285 and next to the Home Depot Headquarters, is open each WEDNESDAY from 4 p.m.-8 p.m. featuring locally naturally grown and heirloom fresh vegetables. FREE TAIJI CLASS for all Tuesday mornings from 9 a.m. to 10 a.m. South Cobb Regional Library: 805 Clay Road , Mableton and on the second Tuesday of each month at The Mable House, 5239 Floyd Road , Mableton . FREE WEEKLY COMMUNITY MEALS ST. LUKE UMC, 5115 Bookwood Drive Mableton wll be serving a free meal every Thursday at 6 p.m. starting September 23 in the Fellowship Hall. All are welcome. Entrance on lower level in back of church. FREE WEEKLY COMMUNITY DINNER - Please join us! Every Monday night at 6 p.m. Good Shepherd Episcopal Church, 6216 Love Street , Austell. LOCKHEED GEORGIA MANAGEMENT RETIREES Association meets Tuesday at 9 a.m. at the Windy Hill Senior Center. RECOVERY INTERNATIONAL. Every Monday night at 8 p.m. at St. Thomas the Apostle Church, 4300 King Springs Road SE, Smyrna in Room #3, in the community building right next to the church. This group provides a safe and confidential place to talk about life's challenges and receive support for self-help efforts. There is no fee to attend. Recovery International is open to anyone dealing with stress, anxiety, fatigue, anger management, or any other mental or behavioral health concerns. Contact Alicia Garcia at 678-665-5233 for more information. SMYRNA BUSINESS EXCHANGE. Every Thursday from 7 a.m. to 8:30 a.m. at the Smyrna Community Center . 770-795-5079. SMYRNA GOLDEN K KIWANIS: 10 a.m. Tuesday, Windy Hill Senior Center, 1885 Roswell Street, Smyrna. SOUTH COBB TOASTMASTERS Tuesday at 7:30 p.m. South Cobb Recreation Center , 875 Six Flags Drive , Austell. VININGS ROTARY: 12:15 p.m. Wednesday, Vinings Club, Overlook III, 2859 Paces Ferry Road. THE WINDY HILL SQUARE DANCE CLUB Thursday morning 9:30 to 11:30 a.m. at the Windy Hill Senior Center at 1885 Roswell Street, Smyrna. ALZHEIMER'S & DEMENTIA Caregivers Support Group- free 3rd Saturday of each month- 10 a.m. 4005 S. Cobb Drive . Smyrna , Call 770-431-7055 or email woodlandridge@caravita.com for details. AMERICAN LEGION, Post 160 Membership Meeting at 7:30 p.m. every 3rd Tuesday and serves breakfast from 8:am to 11:00am on the 2nd Saturday of each month and the AMERICAN LEGION AUXILIARY, Unit 160 Membership Meeting at 7:30 p.m. every 3rd Tuesday each month. SONS OF THE AMERICAN LEGION, Squadron 160 meets at 7 p.m. on the first Tuesday each month. All of these meetings are at 160 Legion Drive, Smyrna. For more information, access AmericanLegionPost160.org or call 770-436-2501. AMERICAN LEGION POST 264, 6251 Ivy Road , Mableton . Meets every third Wednesday of each month at 7:30 p.m. Bingo--Mon, Tues, Fri 8 p.m., Sat 5 p.m. and Sun 4 p.m.
AUSTELL CITY COUNCIL meets the first Monday of each month for its regular meeting. AUSTELL COMMUNITY TASK FORCE meets every 1st Monday at 7 p.m. at the South Cobb Recreation Center , 875 Six Flags Drive , Austell. www.austelltaskforce.org. AUSTELL LIONS CLUB meets the 2nd and 4th Mondays of each month at Bailey's Diner, 4093 Marietta St. in Powder Springs. Start time 6:45. For information, call Chuck or Denise Cook at 770-948-5992. CBMC'S AUSTELL FELLOWSHIP Luncheon (AFL) and business networking group meets regularly at high noon on the first, third and fifth Tuesday of every month at the Golden Corral Restaurant, 3845 Austell Road (just north of the East-West Connector across from South Cobb Hospital), Marietta. Contact Gary at 404-303-1000 or http://atlanta.cbmc.com/ContactUs.aspx for more information. COBB-MARIETTA RETIRED Educators meet monthly at Windy Hill Senior Center, 770-801-5320, for fellowship, service and support of community projects. CCC MOPS is a non-profit support group for Mothers of Preschoolers and infants which meets the 1st and 3rd Wednesdays of the month at 9:30 a.m. at the Cumberland Community Church in Smyrna . Please visit www.cumberlandmops.com for more information. CHEMOCHIC, a free program sponsored by the Georgia Cancer Foundation for women experiencing Chemotherapy treatment for any type. This empowerment class teaches how to combat the side effects of cancer treatments. ChemoChicSM classes are offered on the fourth Thursday of every month from 1-3 p.m. at the Cancer Wellness at Piedmont at Piedmont Hospital. Led by cancer survivor Rudi Caruthers. Reservations required. To reserve a spot, contact Rudi Caruthers at 770-333-3314, or via e-mail at chemochic@charter.net. DIABETES SUPPORT Group meets at Cobb Hospital , the Oran Conference Room, 1791 Mulkey Road , lower level, on the third Tuesday evening, each month except December, from 6:30 - 8 p.m. Free parking and no cost or registration required. Information regarding various topics is presented through out the year. For more information call 770-793-7818. DISCUSSION GROUP. Every Tuesday night at 7:30 p.m. “Back to Community” meets at Cumberland United Methodist Church, 2375 Paces Ferry Road. This discussion and community action group is open to all and covers a wide range of interesting topics. Join us as we share important information, initiate projects, and search for ways in which we can address our societal crisis through better understanding and local action. FREE MONTHLY DINNER. Leland-Qwest UMC, 81 Veterans Memorial Highway, SE, Mableton, sponsors a free community dinner on the last Wednesday of each month from 6 – 7 p.m. All are welcome. (Enter on left side of the church on the lower level). GENERATIONS: Grandparents Raising Grandchildren offered by Cobb Senior Services. This program provides support and information regarding services in the community. The program meets at the South Cobb Recreation Center every 3rd Tuesday of the month from 6:30 p.m.- 8 p.m. Dinner and child care is provided for the grandparents and children during the free meeting. Please RSVP to Margie Castillo-Carbaugh at 770-528-5364. GEORGIA GOURD SOCIETY’S Smyrna Chapter (Gourd Patch) meets the last Thursday of each month at the Windy Hill Senior Center from 1:00 – 4:00. We have a project each month and create decorated gourd items. No experience required. Contact Nancy at nancycpeterson@charter.net or 770 435-0051. “HOBO SUPPER” Second Thursday of each month, from 5 p.m. – 7 p.m. Community invited---Clarkdale UMC Austell— Powder Springs Road , Clarkdale , Georgia . For $5 you get a Drink, Beans (3 kinds), Mashed Potatoes, Cole Slaw, Corn Bread, Onions, Pickles, Beets and a large variety of homemade desserts to choose from. Community invited. INTOWN ATLANTA PARENTS of Multiples Club (IAPOMC) is a support group for parents of multiples in and around the perimeter with meetings every odd month. We connect parents of multiples with others who not only understand similar parenting challenges, but can offer some tried and true solutions. We offer a great newsletter, informative speakers and fun social gatherings! Contact Christina at info@intownatlantapomc.org. THE JONQUIL GARDEN CLUB meets every 4th Tuesday at the library in downtown Smyrna at 9:30 a.m. The objective of the Jonquil Garden Club is to beautify and preserve our environment by encouraging conservation and plantings, not only in our own gardens, but including public places. Anyone interested in gardening, floral and landscape design is welcome to attend. For further information, you may contact Marilynn Parker at 770-949-6640. MABLETON IMPROVEMENT COALITION (MIC) is a nonprofit citizens group formed to promote quality growth and redevelopment in the 30126 zip code. MIC's Board of Director's meetings are the third Thursday of the month at 7 p.m., generally at the Mable House Arts Center in Mableton . Everyone is welcome. Visit www.mableton.org to confirm meeting location. THE MOMS CLUBS of Smyrna are non-profit support groups for at-home mothers. Smyrna-East chapter includes zip code 30080 west of Atlanta Road and the Vinings Estates neighborhood. Please visit www.freewebs.com/momsclubofsmyrnaeast for more. The Smyrna-Northeast chapter includes zip code 30339 and zip code 30080 east of Atlanta Road. Please visit http://www.momsclubofsmyrnane.com for more. Smyrna-West chapter includes zip code 30082. Please visit www.momsclubofsmyrnawest.com for more. Smyrna/Vinings-West chapter includes zip code 30082 in the Nickajack & Russell school district. Please email momsclubofsmyrnaviningswest@yahoo.com for more information. NEWCOMERS OF COBB COUNTY . We meet each month on the third Tuesday 10 a.m. 770/234-5068 or Email: newcomersofcobbcounty@yahoo.com. Those new to Cobb County, or just looking for new friends and activities, are invited to join in. The NEWCOMERS CLUB OF COBB COUNTY holds a wide variety of social activities throughout the month including Bridge, Canasta, Pinochle, Book Club, Mah Jongg, Ladies Night Out, Golf, Bunco, Chick Flicks, Out to Lunch, Out and about Atlanta, Stitch and Sew, Mexican Train and Weekend Pot Luck Dining. PEBBLEBROOK JR FALCONS Association Quality Recreation * Life Skills * Civic Action Programs 2nd Sunday Monthly Meetings at 5 p.m. 6th Grade Academy at The Barnes Center Coaches & Volunteers always needed and welcome. RIVER LINE HISTORIC AREA COMMITTEE meets usually every third Thursday of the month at the Mable House Arts Center. The committee deals in a variety matters to further the recommendations of the River Line Master Plan. Visit www.mableton.org to verify to verify meeting dates, times, locations and for more details about what the committee is working on. SIGMA ALPHA INTERNATIONAL, Alpha Lamda Chapter, Mableton, meets the 2nd Sunday at 2 p.m. Call Vivian Woods at 770-948-4754 for information. SMYRNA BUSINESS ASSOCIATON: lunch meetings the first Thursday of each month at the Smyrna Community Center, 11:45 p.m.
SMYRNA LIBRARY READING GROUP: meets the first Tuesday of each month at 7:30 pm, at the Smyrna Public Library, 100 Village Green Circle. SOUTH COBB KIWANIS: An effort is underway to bring a Kiwanis Club to South Cobb County. Under the aegis of the Smyrna Club, a group has been meeting twice monthly at the O' Charley's on the East-West Connector, and are working towards a goal of 25 members. If you are interested or would like additional information, please contact Charles Lollis at 770-739-8381. SOUTH COBB LIONS CLUB meets the 1st and 3rd Monday evenings of each month at The South Cobb Community Center. 620 Lions Club Drive in Mableton at 6:30 p.m. Call Bobby Thomas at 678-890-1131 for club information. SOUTH COBB SENIORS Friendship Club meets on the 1st Monday of each month 10:30 a.m. at the Lions Club Drive Community Center, Mableton. Newcomers are welcome to come and join the fellowship and lunch, guest speakers and the love of others. VININGS BUSINESS ASSOCIATION (VBA) meets the first Tuesday of each month for lunch at Social Vinings. Networking and speakers from 11:30 to 1 p.m. Lunch $15 for Members; $20 for Non-Members and guests are always welcome! (no industry restrictions). A Business After-Hours is held the 3rd Tuesday of each month. VININGS VILLAGE CIVIC CLUB meets the first Monday of each month September through June at 7 p.m. at various locations around Vinings. For further information, e-mail us at viningscivicclub@gmail.com or visit our new website: viningsvillagecivicclub.org. Members and Guests are welcome. WEST MARIETTA AGLOW COMMUNITY LIGHTHOUSE (WMA), a local arm of Aglow International, monthly meetings, 7 p.m. the first Thursday at the Smyrna Community Center’s Community Room. For more information on West Marietta Aglow visit www.westmariettaaglow.org or call 404-935-8248. 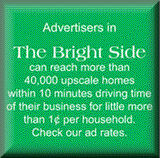 E-mail your organization’s calendar news to news@brightsidecobb.com . Deadline for the OTOBER issue is OCTOBER 7 with publication on OCTOBER 18. Calendar items are accepted from civic groups, non-profits, schools and church organizations and run as space is available. Due to the increasing number of calendar listings, please keep announcements brief. Do NOT send calendar announcements in flyer format. For more information about submitting calendar items or other news, contact us at 770-426-9388 or by e-mail to news@brightsidecobb.com . Find updated calendar items on our website at www.brightsidecobb.com.